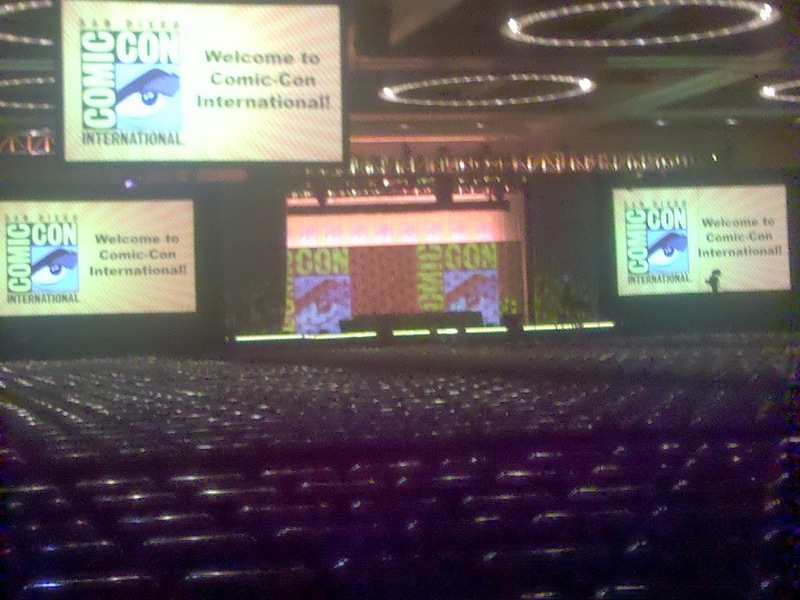 We still don't know everything about Comic-Con - but we know a lot. All four days of panels have been announced, which empowers us to start thinking about how we want to spend our SDCC days and nights. Yes, a variety of last-minute parties and activities will still be announced. But in general, you can start figuring out how to strike a good balance of panel attendance, off-site events, Exhibit Hall shopping and hanging out with your friends. I say "good" and not "perfect" because there is no such thing at Comic-Con. Too many unpredictable forces are in the mix, tugging you hither and yon. You won't be able to control a lot of the influences shaping your SDCC experience, so it's best to surrender all rigidity right now. Which brings me to my first point. #1. Pick your top 4-5 things for the entire Con and make those a priority. Be relaxed about everything else. Obviously it's easy to run up a list of several dozen collectibles, panels, autographs and events you want to attain. And sometimes you can pull off getting the majority of them. In general, though, it's very easy to go off course and wind up getting hardly any. A certain booth is sold out of an item and tells you to come back tomorrow morning. So now you have to choose between that and a panel you were going to line up for in the a.m. Delays and obstacles abound at SDCC. It's best to have a very small number of must-haves and move heaven and earth to get them. If you're successful, then you can attend to your second-tier objectives. #2. After recognizing what you want, recognize what you'll have to give up to get it. #3. Know when to do the Exhibit Hall. The Exhibit Hall is generally most manageable first thing in the morning and right before closing. If you want to do a photo op or VR experience on the floor or buy a certain item, don't wait until the middle of the afternoon - get in as soon as the doors open. Some activities hand out tickets first thing in the morning and those go immediately. #4. Factor travel time into your panel and event plans. That includes crossing the street - which, if you haven't heard, is an epic undertaking at times. Even just maneuvering within the convention center can take some time. By the time the crowd clears from your current room and you move through crowded halls, dodging people photographing cosplayers, wait in line for the escalator, then work your way through a different crowded floor, an amazing amount of time may have passed. #5. Be strategic about going back to your room. Some people think they'll be able to swing by their room at the La Quinta to drop off their bags, then come right back. Again - it's usually more of an undertaking. Traffic is intense around the convention center. Shuttles and taxis get stuck in stop-and-go crawls. Be ready for delays and generally sluggish travel times. You won't be able to flit from the Xbox Lounge to lunch to a panel in 6BCF to your room as easily and casually as you might like. Also, if you're doing a Conan show, take into account that you'll have to pick up the tickets and that the actual taping will eat up most of your afternoon. #6. Don't necessarily count on Nerd HQ. While you might be banking on gobbling up Nerd HQ panels to compensate for whatever you miss at SDCC, remember that those tickets are just a few hundred in number and go very fast. You can't count on getting every ticket you want. So don't necessarily write off an SDCC panel. #7. Be aware of line surprises. Of course the big panels will have ginormous lines. But even smaller panels can have unpredictable line dynamics. If you're orchestrating a complex line scheme with your friends, keep that in mind. Last year I knew someone who was moving from a panel ending at 1:45 to a panel starting at 2 - which he thought he could do because his friend was holding his place in line. Alas, that panel let people in early and his friend was already seated and inside when he arrived. And the remaining line was too long for him to get in. #8. Don't overestimate the number of panels you can sit through. Some panels are just really dull, no joke. It's better to mix panels and roaming time than sit through 5 in a row, and wind up so restless that you end up skipping the late afternoon panel that was originally your #1 choice. #9. In fact, it's good to be generally aware that not all panels are going to deliver. I'm going to do a separate post on how to maximize the creative panels available to you, but for now, I'll just say that some panels have great descriptions and middling execution. So don't view the practical advice panels as some kind of make-or-break career opportunity - some are great, but quite a few just give out advice that you could pick up in any online forum. Every year I see attendees treat a certain panel as their big break to become a voice actor or publish a screenplay or sell their game, and it's just not the case. That isn't to criticize the panelists, just to set realistic expectations. If you've never been to a big Con before and don't know what to expect, I'd advise mixing up your first day. Try a panel or two, prowl through the Exhibit Hall, take in a gaming tournament if that's your thing, and get outside to enjoy the off-sites. Go into the Gaslamp for a meal and check out Nerd HQ. Do that and you'll understand which parts of the Con you naturally enjoy and the parts that don't work for you. #11. Remember to build downtime into your day. Comic-Con is like Vegas meets Mardi Gras cranked at high speed inside your brain. I'll stereotype here and say a lot of us attendees are natural introverts who need a certain amount of alone time to recharge. Being in the midst of too many humans and too many demands on our attention can turn a fun Con into an overwhelming experience. Leave yourself some breathing room to swim in your hotel pool or catch a movie/screening and isolate in the dark for a few hours. The last thing you want to do is book every hour of the day. #12. Make time for people. If you're super-driven, it's easy to view every person around you as some kind of impediment to the booth, toy, book or panel you want. Or you and your boon companion can stick together to the point where you block everyone else out. That's an option, but remember that you're surrounded by thousands of people who are intelligent, creative, friendly and share your interests. Take time to get to know the people in line with you. Chat up a booth vendor. Go ahead and tell a small press artist how much you admire them. The friends you make at Comic-Con will be one of the aspects you remember long after the Game of Thrones panel has faded from memory - and you'll often get invites, inside scoops and assistance you wouldn't have otherwise. #13. In general, don't be too ambitious about the Con you're going to have. It might seem at a glance that you can see all your favorite show panels while getting a photo with John Barrowman and buying up multiple Dark Horse exclusives for your friends back home - in addition to the 2-3 parties you'll swing by each night. The reality is often quite different. Set your top priorities, then relax and enjoy whatever happens. Most attendees find their plans disintegrating at some point. But sometimes the best things at Comic-Con are a complete and utter surprise - so try to enjoy the ride whatever happens. Hi. Newbie here getting ready for my first SDCC. I have a question about something you wrote above...."Hall H & Ballroom 20 playback is a nightly option" What do you mean by playback? Is there a way to experience Hall H without dealing with lines? surely not. Yes, there is! Well, kind of. The playback sessions show recordings of the panels, without any trailers or footage. You just have to check the schedule and see which panel will be shown when. These are shown over at the Omni. Go to the programming and search for "Playback Room" and you'll see the whole schedule. Thanks for reminding me that first-timers don't know this. I'm going to amend the post. Wow. Good to know. I will be deep diving into the schedule in the next day or so. I've spent most of my time figuring out what to do on days I don't have a ticket and found some great options thanks to your blog. I've checked out a few and yours is the most helpful so thanks again!